Religious people tend to view the Holy Spirit as a kind of Divine Bookkeeper, a recorder of men’s sins. But if Jesus did away with sin once and for all by the sacrifice of Himself (He 9:26), what’s left for the Holy Spirit to do? He must be unemployed! What did Jeremiah (31:33) mean when he prophesied that the Spirit would write His laws in our hearts? Was he promoting a relationship with the rules? No. Jesus is the law-keeper who lives within. Think of the Holy Spirit as a match-maker wooing you to Jesus. As we rest in Jesus and let Him live His life through ours (Gal 2:20), we find ourselves keeping the commandments effortlessly. “For what the law could not do in that it was weak through the flesh, God did by sending His own Son in the likeness of sinful flesh, on account of sin: He condemned sin in the flesh, that the righteous requirement of the law might be fulfilled in us who do not walk according to the flesh but according to the Spirit.” (Rms 8:3-4) More here. 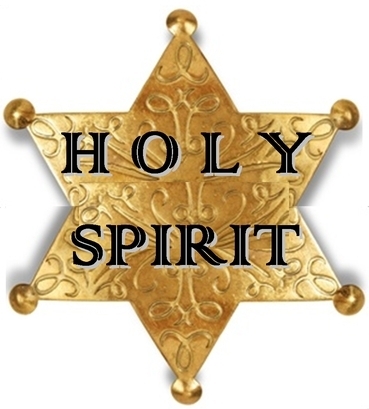 Since many believers have been brought up on a diet of law and obligation, it is natural to think of the Holy Spirit as a Policeman enforcing God’s commands. But this is confusing covenants. How does the Holy Spirit strengthen and build up the church? Principally by revealing more and more of Jesus (Jn 16:14, Phm 1:6). The Holy Spirit is so good at what He does, that Jesus said that it was for our good that He leave so the Spirit could come (Jn 16:7). Think about that! We’re better off now with the Spirit than we were with Jesus in the flesh. They really are all on the same team. The Holy Spirit is in the business of making known to us the mystery of God’s will (Eph 1:9, Dan 2:19, Rom 11:25). Jesus said the Holy Spirit would guide us, not into some truth, but into all truth (Jn 16:13). He is not the author of confusion – that would be the devil. Rather, the Holy Spirit is the One who helps us make sense out of all Jesus said and did and everything that is about to happen (Jn 16:13, MSG). He really is the most wonderful Guide. Keep in step with the Spirit and you’ll never put a foot wrong. The Holy Spirit is the most powerful Being in the universe and He is for you (Rm 8:31). Some translations call Him “The Friend” for He truly is the great Friend of sinners (leading them to Jesus) and saints (encouraging and guiding us). He never leaves us for He is the Friend who sticks closer than a brother (Pro 18:24). Jesus said the Spirit would be in us like a river (Jn 7:38). Just as a river needs to flow, so too does the Holy Spirit desire to flow out of you to refresh and bring life to others. One emotion which is consistently linked with the Holy Spirit is joy (Lk 10:21, Acts 13:52, 1 Th 1:6). If there is no joy in your walk, lean on the Holy Spirit. Believe that He is with you and in you to strengthen you with the Lord’s joy. If you are timid in your witness, understand that God has not given you a spirit of intimidation (2 Tim 1:7). His kingdom is characterized by righteousness, peace and joy in the Holy Spirit. In Greek the Holy Spirit is described as a paraclete (Jn 16:7). The image is of a soldier who partners with us side-by-side in combat like Jonathan’s armor-bearer (1 Sam 14:7). And what a Powerful Partner He is! He never loses, He bears no scars, and His enemies have already been defeated! If you are saved then you already are acquainted with His work, for you could never have confessed Jesus as Lord without His help (1 Cor 12:3). (Have you ever thanked Him for that?) Many Christians know what it is to walk in the authority of Jesus’ Name, but they do not fully operate in the power of the Spirit. They’re like a cop with a badge but no gun. Jesus gave us authority (Lk 10:19) but said the Spirit would give us power (Acts 1:8). When the Spirit came on Saul in the Old Testament, the Bible says he was turned into another man who was empowered to do “whatever the occasion demands” (1 Sam 10:6-7, NKJV). Similarly, in the new covenant the Spirit turns you into a new creation who is empowered to preach and demonstrate the gospel of the kingdom (1 Co 2:4). This includes healing the sick, driving out demons, and raising the dead, as the occasion demands (Mt 10:8). See Acts 3:11-16 for a picture of what this looks like. Do you have an opportunity to speak but you’re stuck for words? Never fear for He is here! The gospel message is conveyed with words and wonders and the Holy Spirit provides them both. Trust Him – He’s really in you and with you! – and ask for His wisdom. He gives generously (Jas 1:5) and His wise words come pre-packaged with boldness (Acts 4:31). The modern church has diluted the role of the Holy Spirit to accommodate their limited experience of the supernatural. But Jesus promised that “signs will accompany those who believe” (Mk 16:17). What miracles were attributed to the Holy Spirit in the book of Acts? All of them! It’s the book of His acts. Every time the good news is preached, the Holy Spirit is looking to confirm the message with signs following. His ministry is revealed in a Show and Tell gospel. “With that, Peter, full of the Holy Spirit, let loose…” (Acts 4:8, MSG). Cool huh? More covenant confusion! The ministry of the law brings death and condemnation, but the ministry of the Spirit brings life and righteousness (2 Cor 3:6-9). True, He’ll let us come to the end of ourselves so that we might learn to trust Him. But He loves you just the same whether you stay in the boat or dance on the water. He comforts, He doesn’t condemn. Jesus promised life in abundance (Jn 10:10). The Holy Spirit delivers on that promise by replacing fear with courage, weakness with strength, and death with resurrection life (Acts 4:8-13, 2 Co 1:9, 12:10). There is one body, one Spirit, one hope, one Lord, one faith, one baptism, one God and Father of all, who is over all (Eph 4:4-6). We see the distinctions and call them “flavors,” but God sees one body with many members (Rms 12:5). The Holy Spirit produces unity in the body, not division. HS pray for us believers in harmony with God’s will so that everything works together for good. (Roman 8:27-28) Thanks Paul! Hi Paul, I’ve received your writings for approx 6 months. What you put out deserves to be read by a wider audience. I think you should write a book. Your grasp on Scripture enables you to highlight the differences between law and grace in an easy, humorous and likeable way and I think many would benefit by it. A few people have suggested I write a book, but I’m left wondering why people would pay for something they’re currently getting for free? Your writings are a blessing to me. Whenever I get a chance to go on the net to read ( I don’t get much time as I have 4 kids) I read your wonderful writings. Keep up your good work, many have and will benefit from your site. I would like to encourage you to continue with your effort in revealing simple truths that have been hidden for so long due to the fact that people are comfortable with the “religion” that they have been subjected to. I believe that the younger generation are rising up and now they demand the truth and are sick and tired of this debilitating religious drama/soap that the church puts on every Sunday! how was john the baptist filled with the holy spirit before the day of pentecost,and how was what he had different from the baptism of the holy spirit? #5 because GOD himself (Jesus) gave them the authority to use HIS name to do all these things. Although i dont remember them raising the dead before Acts. God Himself was with them on the earth, then He sent the spirit (Himself) in his place as he needed to go where everyone of us born again Christians go, to the Father. I could explain more but it’s late for me right now 2:42am, I just thought I’d check the comments before going to sleep lol (I love the teachings by His Spirit that come through Paul). thanks anthony any thoughts on #4. I’m a big fan! Keep it up! Great, very feeding, tx a lot!!!! Great word! It seems as if covenant confusion is at the root of a great deal of the doubt, condemnation , and fear that attacks believers. The Body needs grounding in the Personhood of the Holy Spirit, the Spirit of Grace. Religion always robs the saints of the beauty and quite honestly the simplicity of trusting God. Mixing grace and works causes confusion. Single most subtle attack of the enemy on the Church of Jesus Christ Keep spreading the Word! The law of Moses which includes the Ten Commandments is from Mt. Sinai. As believers, we have not come to this mountain. Jeremiah said God would make a new covenant, not like the old one. A new covenant would of necessity have new laws and a new Priest, not like the old ones. A change in the priesthood would require a change in law, so this can not be the law of Moses that is written on our hearts now. In this passage, His law on our heart (in this new covenant that will come) is being contrasted with the Law of Moses (the old covenant which will soon disappear). So the Holy Spirit is not in us helping us keep the law whether it is the law of Moses, the moral law, or any self imposed law that we have put on ourselves. He is in us leading us into all truth. Jesus said the greatest commandment under the law is to love God with all you mind, heart and soul and to love others as you love yourself. This is not the greatest commandment under grace. John said I give you a new commandment. In essence, the greatest commandment in this new covenant is to believe that God loves you with all His heart, His mind and His soul. When you start to see this, you will begin to love others like Jesus loves you. It is a completely different mind set. It is all about the renewal of the mind. Paul I love all these post. But I have a question. What are your thoughts on the baptism with the Holy Spirit With the Evidence of Speaking in other Tongues. @Jim E. When Jesus gave the greatest commandment, He was quoting from the old testament. See Deut. 6:5. Jesus did not come to abolish the old law (or replace it) but to fulfill it. See Mat 5:17-18. The commandments on the one hand shows us how much we need Jesus’ salvation and on the other hand gives practical advice on how to love God and each other as God has first loved us. In other words the new commandment is the same as the old commandment, only seen through the light of the gospel. Also Jesus gave us a new covenant by fulfilling the old. See Heb 9. The old testament is as valid today as it was before Christ. However, now we can understand it better and much of what it promised is already fulfilled. That said, since we don’t need much of the laws any more to teach us of Christ, they have indeed expired. Laws of sacrifices, etc. This makes me feel that the medication I’m required to take to stay alive is defective. The entire spirit of it’s administration denies the truth of the Holy Spirit and His goodness.